I’m sure by now everyone has heard the news… the scandal spreading through the corridors of the Holy Mother Church. It is quite devastating to say the least. And Pope Francis... well his attitude is quite telling… and I will not go into my feelings about him, as right now, they are rather uncharitable at best. So many people are shocked and feel let down. So many people don’t know what to do. I spoke with several people from my local parish today and they were devastated, the trust they had for the Church… for her priests has been shattered. The bad thing is that so many of the faithful who fill the pews week in and week out… hadn’t a clue just how bad things how gotten inside the Church. Those who didn’t hear about the homosexual agenda within the Church, for whatever reason, now feel like a bomb has exploded in their midst, shattering their image of the Holy Mother Church, shattering the one thing that they had always counted on. And now, many of these ‘faithful’ Catholics are left wondering what to do next. Well, the first thing we must do is fight our fear. We must humbly pray that God will give us the courage and the grace to allow this purging of our Church. Of course we are all afraid of this wild blaze that is moving through the Church, but we must let it do its work. It can, and it will purify the Church… But only if we do not allow ourselves to fall into panic and fear. Seek out the embrace and support of our Dear Blessed Mother, she will give you the courage to stand at the foot of the cross when all the others have gone and fled. Stand firm. Pray the rosary. Everyday. We must pray for our priests by name. Pray for their strength and their holiness. Let them know that you are praying for them. For those who have abandoned their duties, we must pray that they return to their love of Christ, particularly, Christ in the Eucharist, who so often is neglected and abandoned by His dear sons. Ask God for His mercy and ask for His grace to wash over all of our priests… Pray that the Lord will help our holy priests to remain holy. Offer up your daily suffering to build the Church, one holy member at a time. We should also pray the Divine Mercy Chaplet so that God’s mercy will be upon each of us to fulfill our vocations. We need to pray for the conversion of sinners everywhere. O Jesus, Eternal Priest, look down with love upon Thy priests. Fill them with burning zeal for the conversion of sinners. Keep them within the shelter of Thy Sacred Heart. Keep unstained their anointed hands. which daily touch Thy Sacred Body. Keep unsullied their lips purpled with Thy precious Blood. Keep pure and unearthly their hearts sealed with the sublime marks of Thy glorious Priesthood. Let Thy holy love protect them from the world’s contagion. Bless their labors with abundant fruit, and may the souls to whom they minister on earth be one day their joy and consolation in heaven. Amen. It is really not a time to point our fingers at anyone else… If we must point at someone… we should be pointing at ourselves. All of us can do better. All of us can do more. We need to start the wave of conversion in our own soul. And if we are talking about really cleaning house… why not start with ourselves? We should go to confession. Take the family and unburden yourselves of your sins, they’re just hindering your own conversion. Besides, a clean conscience helps us to be more open to receiving God’s grace. Despite how bad it gets, we mustn’t lose hope… we mustn’t lose our Faith. We need to remember that the Church has faced many devastating blows in the past. Actually, if we go all the way back to Christ we find that from the beginning there have been troubles in the hearts of those men chosen to be the Church. Remember, Christ chose twelve men to be His Apostles… twelve men to start His Church and to spread the Truth. And what happened? Of the twelve, several of them floundered about in their commitment to Christ… and Judas well, he sold Christ out and betrayed the Lord. Even though he had originally committed himself to Jesus, he allowed his sins to rule him. He allowed his own sinful inclinations to turn on the Lord, and to actually betray Him for thirty pieces of silver. Now is not the time to whine and complain. It is a time for conversion. It is a time for us to hunker down in prayer. God is calling us to be saints. He is calling for us to convert our hearts…convert our lives for Him. Pray the rosary, the Blessed Mother can do wonders for the faint of heart… With the rosary, She can even soften the most hardened of hearts. But we must humble ourselves before the Lord. Spend an hour with Jesus in the Eucharist… There are so many things we need to do at this difficult time, but the last thing any of us need to do is to leave the Faith. God will right the wrongs. God has promised that the gates of hell will not prevail against the Holy Catholic Church, won’t you join me and Faithful Catholics all over the world and add an Hour of Adoration to your weekly schedule? 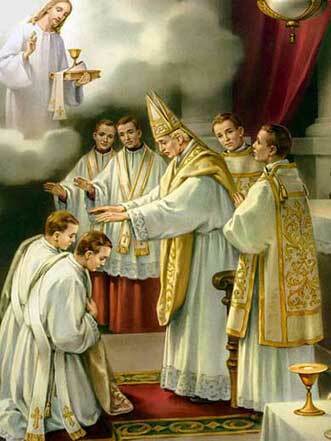 Pray for the conversion of our priests. Pray for good and holy priests. And finally, pray for our sons, that they may open their hearts to God. That they may listen to the voice of God as it calls them to serve Him in a vocation to the priesthood. Support these young men in any way that you can. But please dear friends, do not abandon the Faith over the sinfulness of men. As I close I would like to leave you with this writing from St. Teresa of Avila who once saw the demons coming out of an evil priest while he celebrated Mass. I think it is an important message for all of us today to remember as the Truth is revealed about the darkness that lurks in the hearts of men. 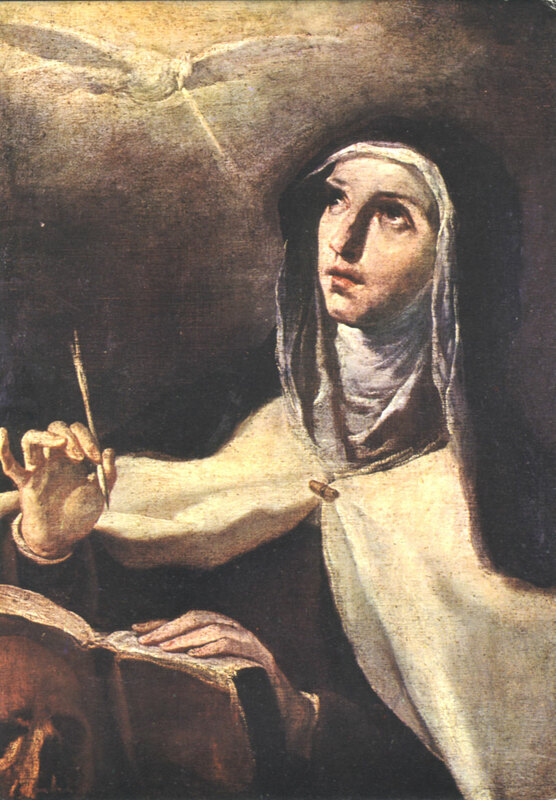 Praying for Priest in Mortal Sin……..St. Teresa of Avila..
23. “Once, while approaching to receive Communion, I saw with my soul’s eyes more clearly than with my bodily eyes two devils whose appearance was abominable. It seems to me their horns were wrapped around the poor priest’s throat, and in the host that was going to be given to me I saw my Lord with the majesty I mentioned placed in the priest’s hands, which were clearly seen to be His offender’s; and I understood that that soul was in mortal sin. What would it be my Lord, to see Your beauty in the midst of such abominable figures? They were as though frightened and terrified in Your presence, for it seems they would have very eagerly fled had You allowed them. This vision caused me such great disturbance I don’t know how I was able to receive Communion, and I was left with a great fear, thinking that if the vision had been from God, His Majesty would not have permitted me to see the evil that was in that soul. The Lord Himself told me to pray for him and that He had permitted it so that I might understand the power of the words of consecration and how God does not fail to be present, however evil the priest who recites them, and that I might see His great goodness since He places Himself in those hands of His enemy, and all out of love for me and for everyone. I understood well how much more priests are obliged to be good than are others, how deplorable a thing it is to receive this most Blessed Sacrament unworthily, and how much the devil is lord over the soul in mortal sin. It did me a great deal of good and brought me deep understanding of what I owed God. May He be blessed forever and ever. This entry was posted in Some thoughts and tagged cleansing fire of God, Eucharistic adoration, Jesus in the Eucharist, Pray the rosary, praying for our priests, scandal in the Church, St. Teresa of Avila vision of the priest. Bookmark the permalink.